Reporting data is a comprehensive view of all unit's hardware. Units will wish to filter the data to reflect the computers in their unit. Filters can be found to the right of the data on the Summary tab. If a change is made to the filters on the Summary tab, this will affect what displays on all other tabs. Once selected, these filters will apply to other reporting tabs. Click the Remember my change link in the bottom left corner of the Summary Tab Report. Name your custom view using the dialog box. 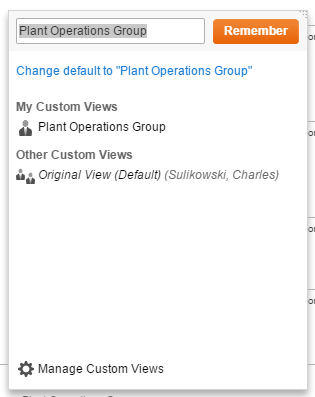 If you wish to make a custom views your default view, click the Remember my changes link a second time. Click the Change default to "Report Name" hyperlink. Units can also hide columns in reports by hovering over the column name and clicking the Minus icon. 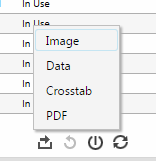 Units can export report data to a spreadsheet by clicking the Export icon at the bottom of each page. Provides rollup of inventory information sorted by computer model and device age. Designed mostly to identify computers that are due for disposition / replacement. Note: This page also provides the filters to drill down by unit, department, etc. Provides status information about computers including: age, use (e.g., shared, loaner, etc. ), warranty information, and whether the computer has a MiWorkspace or Non-MiWorkspace build. Provides additional computer specifications (e.g., RAM, hard-drive size, CPU, etc.) and last login detail to assist in tying computer to user. Provides additional detail about the location of computer and user (e.g., building, floor, room, and other details) that are important when planning replacement of existing devices. Provides a spreadsheet view of current manufacture models and CI status (e.g., in repair, in use, etc.). Report identifies computers that are assigned to user, on loan, on the shelf, in disposition, etc. Provides department roll-up of computer age. Developed primarily for MiWorkspace leadership to review the aging of our entire computer fleet and global planning. Note: Not tied to Report Summary tab, has additional filtering. Provides summary information about the computers, the unit ownership, and the buildings in which they are located.